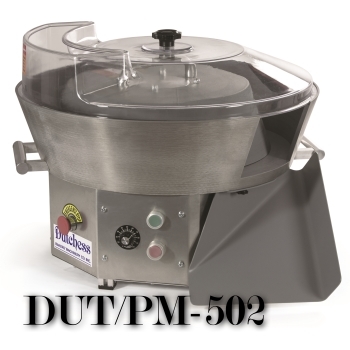 DUT/PM-502 Dough Rounder/Kneader -- Dutchess Bakers Machinery Co. Inc.
24" Diameter Bowl with Moulding Surface. Hand Feed or Use Under a Divider. Sealed Heavy Duty Ball Bearings. Easy to Clean Removable Bowl. Output of 400-700 pieces Per Hour. 1 oz. up to 24 oz. Per Piece Capacity. Pair it with a Dutchess Model BMIH Divider.